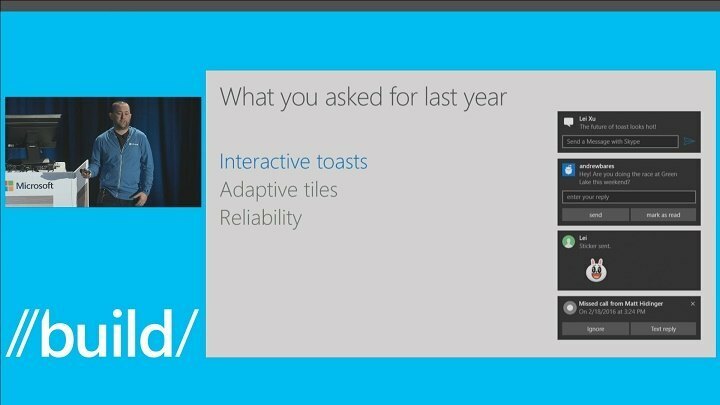 During the Build 2016 conference, Microsoft showcased many new features for Windows 10, one of them being Chasable Live Tiles. Alongside minor Live Tiles improvements, Microsoft showcased some major Action Center changes during this year’s Build. Action Center is a big part of Windows 10 and according to Microsoft, we’ll finally have access to widgets and tiles in it. Although useful, Action Center looks a bit plain. Realizing that, Microsoft plans to spice it up a little with the addition of widgets and tiles. These are some exciting improvements to the desktop version of Action Center, with Microsoft having announced that the same improved Action Center will be available on Windows 10 Mobile as well. Both mobile and desktop Action Centers will look the same, and most importantly, they will be synced. Microsoft announced that Action Center will be stored in the cloud and synced across all of your devices. With Action Center in the cloud, you’ll be able to see your phone’s notifications on your Windows 10 PC and dismiss them right from your computer. The new Action Center is optimized for multiple platforms, meaning you’ll be able to get Android notifications on Windows 10 using the Cortana Android app. Toast notifications got an overhaul and now offer more interactivity to the users. With new Interactive Toast Notifications, you can quickly reply to a message or snooze your alarm right, for instance. These are just few a examples, but we’re positive developers will utilize these new features to the fullest extent. If you are a developer, you’ll be pleased to know you can now customize Live Tiles even more by breaking all parts of a Live Tile, such as images, text and background images, into individual customizable elements. This change might seem uninteresting to average users but with this change, developers will be able to produce more complex Live Tiles in the future. These are some massive changes that will bring both PC and mobile users together, and if you’re excited about the upcoming changes, you’ll have to wait for the Anniversary Update before you can try them.